The latest list of Al DiMeola tour dates from DiMeola's official website. Cool interview with Rodrigo y Gabriela where they discuss how Al DiMeola has influenced them, followed by the full version of "Mediterranean Sundance" from their performance together in Paris. Al DiMeola jammming with Rodrigo y Gabriela at Casino de Paris, 11/12/09. Awesome! The Return to Forever reunion tour is quickly shaping up to the be the jazz event of 2008. Though they haven't recorded an album since the 1970s, this classic groundbreaking fusion band (consisting of Chick Corea - keys, Stanley Clarke - bass, Lenny White - drums, and Al Di Meola - guitar) have been filling concert halls since they first hit the road in late May. I was fortunate enough to see RTF with my father when they played the historic Chicago Theatre this past Friday night, and blown away by the sheer musicianship this band possesses. The first thing I noticed while we made our way to our seats was the audience. While there were some younger folks in attendance, the age demographic of the crowd seemed skewed to the 50+ set. There are always some older "fuseheads" at the types of shows I see, but this crowd was loaded with them. The band/promoter obviously anticipated this, since the pre-show house music consisted of RTF-era fusion classics such as "Crosswind" and "Proto Cosmos." When the band took the stage, they received the first of many standing ovations. This was an enthusiastic crowd to say the least, but it was the band's own enthusiasm that really struck me. From their opening song onward, the guys were obviously having a great time onstage. They were loose and fun to watch, and their mood definitely rubbed off on the audience. Despite a few technical glitches (e.g., one of Di Meola's amp heads gave up the ghost), the show was fantastic and included many of the band's classic songs over the course of two sets. Di Meola had a couple of his PRS guitars, but he also played his black 1958 Les Paul. This, along with the appearance Clarke's Alembic bass and Corea's Fender Rhodes, added to the evening's "throwback" vibe. "Hymn of the Seventh Galaxy" and "Sorceress" were big highlights from the first set for me. The fast doubled lines in these and other songs were always tight and punchy. Di Meola had some great solos in these tunes, and was amazing for the entire show. While his patented fast-as-possible triplet patterns always whipped the crowd into a frenzy, I found his mid-tempo lines to be more interesting and dynamic - especially when he would drop in some chromatic or diminished ideas. And his rhythm work was equally impressive. On some songs, such as "Vulcan Worlds," he displayed some of the funkiest, syncopated strumming work I've every witnessed. Take it from me, this guy's right hand is legendary for a reason. The second set was played with acoustic instruments, and included solo showcases from each band member. Di Meola opened the set with an incredible unaccompanied nylon-string solo, but it was Clarke's acoustic solo spot that really stole the show (or at least the second set). The types of things he played (slapping, amazing fast runs) would be difficult for a lesser player on an electric bass, much less on a giant double bass like Clarke was playing. The term "jaw-dropping" jumps to mind. The second set also included some cool straight-ahead acoustic jazz from the trio of Corea, Clarke, and White. For the final encore, they played a great version of the Corea standard "Spain." Corea pulled out his "keytar" for this one, and enticed the crowd into a fun call-and-response segment. It was a great ending to a great show. On the way home I had a thought - In this day and age, especially in the United States, which bands or players from the jazz fusion genre can fill a room as prestigious as the Chicago Theatre for a premium ticket price? Return To Forever, with it's lineup of legends, is perhaps the only band currently touring that can pull this off. All jazz and/or fusion fans need to catch this tour if they have a chance. Check out http://www.return2forever.com for more info on the tour (including pics from this show). Return To Forever tour dates announced! The Los Angeles Times' Calenderlive.com site has a great article up regarding the upcoming Return to Forever reunion tour. The piece, written by Don Heckman, has details from one of the band's tour rehearsals and photo sessions. More details on the tour will be announced on March 3rd. For the uninitiated - Return to Forever (featuring Chick Corea - keys, Stanley Clarke - bass, Lenny White - drums, and Al DiMeola - guitar) was one of the most influential jazz-rock bands of the 1970s. This lineup, which has not played together in some 25 years, will be touring the US and Europe this year. More details have been released on next summer's Return To Forever reunion. The band (featuring Chick Corea - keys, Stanley Clarke - bass, Lenny White - drums, and Al DiMeola - guitar) will play 40-50 dates across North America and Europe. An anthology will also be released in conjunction with the tour featuring remastered tracks from the Hymn of the Seventh Galaxy, Where Have I Known You Before, No Mystery, and Romantic Warrior albums. Read the Abstract Logix news post for more info. The rumors are true: The legendary jazz fusion band Return To Forever will be reuniting for a summer 2008 tour. The lineup will be Chick Corea - keys, Stanley Clarke - bass, Lenny White - drums, and Al DiMeola - guitar. Arguably the most well-known of the various RTF incarnations, this foursome was together from 1973-1976, and produced three records including the incredible Romantic Warrior album in 1976. Exact dates for the reunion tour have not yet been announced. Al DiMeola will be releasing a new album Sept 26th. 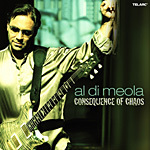 "Consequense Of Chaos" will be a major return to solid-body electric guitar work for DiMeola. Chick Corea, Steve Gadd, John Pattitucci, Barry Miles, appear on the disc, as well as members of DiMeola's own band. A tour is scheduled for the US and Germany to support the album as well.